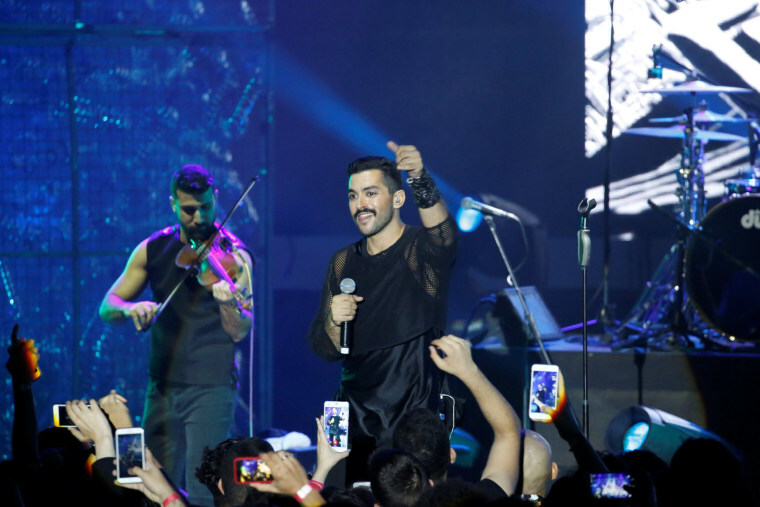 BEIRUT - Lebanese band Mashrou' Leila's blend of indie rock and lyrics about social and political injustice has won a passionate following among fans seeking an alternative to Arab pop with its romantic themes. But securing a firm footing in the Middle East has been difficult for the band. Jordanian authorities canceled its concert in June, for the second year in a row. Lebanese radio stations steer clear of its music. "They don't know where to place us," said Hamed Sinno, 29, the openly gay vocalist of the five-member band formed in 2008 that has stirred controversy in the region with songs tackling oppression, classism, sectarianism and homophobia. "We can't play in Syria, we can't play in Palestine, we can’t play in Jordan apparently, we obviously can’t play in Saudi," he said, listing places where conflict or social conservatism prohibit them from performing. And things don't seem to be changing in the region, Sinno said, so the band has been playing more abroad. Mashrou' Leila has played concerts in cities including Paris, London, New York and San Francisco since its 2015 album Ibn El Leil reached number 13 on the Billboard world album chart. The band's music has broken away from the norm in a region whose pop stars steer clear of social issues, singing mostly of romances. Arabic music doesn't really have a tradition of "teenagers rebelling or expressing a lot of anger", Sinno said. "Are we the rebellious teenagers of the Middle East? No, I think we’re just a band that’s writing about our lives and about the stuff that affects us," he said. "And because of the way we are as individuals and people, a lot of what does inspire us is political, because that’s the stuff that we freak out about on a daily basis." The band's most recent song, Roman, focuses on overcoming betrayal, with references to Judas and Jesus. The video was directed by a woman, Jessy Moussallem, and is dominated by women, their hair and hijabs flapping in the wind side by side in the back of a truck as Sinno sings among them. "I think it's literally speaking about what I would like to see and what I think men should do, especially in the Middle East, which is just to shut up and sit back," Sinno said in an interview ahead of a concert in the Lebanese town of Ehden. At sunset, young fans gathered at the venue, wearing shirts emblazoned with the Arabic numeral "3", the symbol of Mashrou' Leila's latest and third album. Others wore Nirvana and Beatles T-shirts. Both Lebanese and non-Lebanese fans said they liked the band because it is not at all like traditional Arabic music. "They have this sort of Western twang," a Lebanese fan, Anthony, said. "The way he sings and vocalizes, it's not very clear what he's saying." In fact, Sinno said the music they most identified with growing up came out of the United States and Britain. The band draws inspiration from R&B, jazz, rock, Seattle grunge and metal, he added, and they listen to a lot of Michael Jackson, Tina Turner, Madonna and Fleetwood Mac. Beirut, with its eclectic mixture of noise and language, also had a big influence on the band. Asked if he believes the band's music had alienated audiences, Sinno said that's always a risk, but one he's willing to take. Critics in the region often focus on Sinno's way of singing: he elongates words so they are often incomprehensible. The Arabic word for jasmine hung in the air for 11 seconds in a live rendition of "Shim el Yasmine", or "Smell the Jasmine". An hour after listening to the band rehearse in Ehden, someone unfamiliar with their music looked up and said: "You know, I think I can hear them sing the occasional Arabic word."